Background: Multiple sclerosis (MS) is a chronic inflammatory demyelinating disease of the central nervous system (CNS). Of the plethora of motor and sensory disturbances experienced by sufferers, neuropathic pain is a highly prevalent and debilitating symptom, and at present remains extremely difficult to treat. Common forms of neuropathic pain seen in MS patients include central neuropathic pain, Lhermitte's phenomenon and trigeminal neuralgia, which are all speculated to arise from specific patterns of lesion formation. 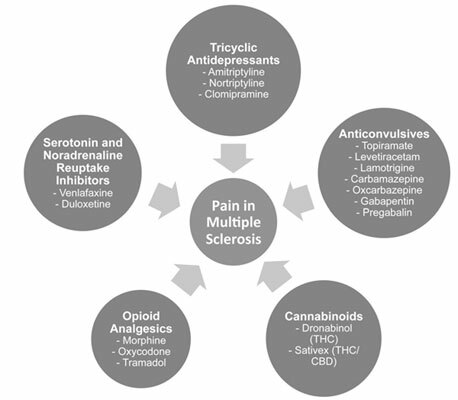 Objective: Efficacious pharmacological interventions for the treatment of neuropathic pain associated with MS are lacking, and have been largely informed by drug trials in peripheral neuropathies and spinal cord injury. Method/Results: Neuropathic pain in MS is inadequately relieved by conventional analgesics, and first-line therapies are generally comprised of anti-depressive and anti-convulsive drugs. A range of alternatives have been proposed and tested with variable success, including cannabinoids and certain opioid analgesics. Animals with experimental autoimmune encephalomyelitis (EAE), an autoimmune model of MS, also exhibit neuropathic pain symptoms. Conclusion: Studies aimed at understanding the mechanisms underlying EAE-induced neuropathic pain and investigating the efficacy of novel pharmacological interventions at the animal level offer an exciting area of future research, and may inform future therapeutic options for MS-associated neuropathic pain. Central extremity pain, experimental autoimmune encephalomyelitis, Lhermitte's phenomenon, multiple sclerosis, neuropathic pain, trigeminal neuralgia.